← Local Government Pension Funds failing to protect themselves from financial risk of climate – Friends of the Earth and Platform London report reveals. How Local Government Pension Funds are failing to protect themselves from the financial risks of climate change. Platform and Friends of the Earth reveal how UK Local Government Pension Funds are failing to protect themselves from the financial risks of climate change. Local government pension funds have a duty to act in their members best interests. This is secured both by ensuring financial performance and by acting in the best interests of the society at large. Climate change will cause unprecedented loss of life and as such it is in the best interests of us all to address it. Climate change also poses economic threats both by altering environmental conditions and by demanding changes to the structure of the economy, as established by the Bank of England and the Environmental Audit Committee. In response the UK government is now proposing new legal duties for pension funds regarding climate change risks. Past assessments have shown that the Local Government Pension Scheme (LGPS), administered in 97 local authorities, is heavily invested in fossil fuel companies, whose businesses practices are driving climate change. This analysis considers if this is symptomatic of a wider failure to take climate change seriously within the LGPS. A framework for best practice was established by taking evidence from industry consultants and advisors, including Mercer, the Local Authority Pension Fund Forum, and Hymans Robertson. • Assessing and measuring climate risks in their portfolio. • Managing them by divesting from /reducing exposure to high-risk companies and investing in low-carbon. • Engaging with companies who can improve performance. • Enshrining their commitment in clear and transparent policy and strategy. 1. Is climate change acknowledged as a material financial risk? 2. Are climate risks being measured as part of a coherent climate strategy? 3. Has a commitment been made to reduce investment in high risk companies, such as those involved in fossil fuel production? 4. Have clear goals been set for engagement with companies on climate change? 5. Are there investments in renewable and green technologies? • 5 funds acknowledge climate risks but are not acting to address them adequately. These are Lothian, West Midlands, West Yorkshire, Strathclyde and Northern Ireland. • 2 funds are developing strategies to tackle climate change risks, but their actions are too heavily focussed on shareholder engagement without meaningful goals, deadlines or consequences. These are Greater Manchester and South Yorkshire. • 4 funds are developing stronger climate change strategies including tilting or partial divestment from fossil fuels as well as engagement, and/or have engagement activities with clearer goals and timelines. These are Merseyside, Lancashire, London and Avon. The majority of funds assessed explicitly state that climate change is a material financial risk. Kent was the only fund to state that climate change is not a financial risk. Despite this, over 50% of the funds have not measured climate risks and the majority of funds do not have explicit strategies for dealing with these risks. A small minority of funds – Merseyside, London and Avon – are reducing their risk exposure by reducing their exposure to fossil fuel companies. Some funds are applying ‘tilts’ away from fossil fuel or are considering setting fossil fuel divestment targets. Many of the funds assessed claim to use shareholder engagement with companies to address climate change but most of these funds do not have clear goals or targets for this engagement. No fund was able to provide evidence for the effectiveness of their engagement at forcing fossil fuel companies to switch their core business models away from fossil fuels. A majority of funds have some low carbon investments, but the size of such investments varies. 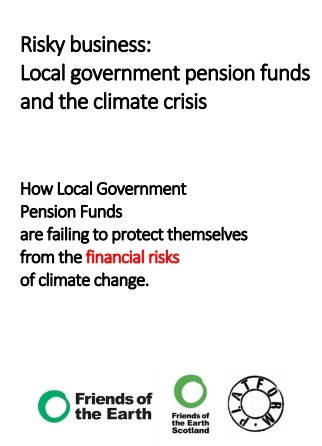 Overall, we conclude that the largest UK local government pension funds are failing to act effectively on climate change and are not properly accounting for the risks it poses. The assets under management of the funds assessed were £148 billion and constitute approximately half of the value of the entire LGPS. As such they give a strong indication that climate change is not being adequately addressed within the wider LGPS. This should give serious concern to pension funds, local councillors and the 6 million fund members who rely on the LGPS for security in retirement. A set of questions for pension funds to answer is included in the report. The full report from Friends of the Earth, FoE Scotland and Platform is available to download.